Human islets were treated with a drug to kill the insulin-making cells, then treated with either an empty virus (left) or a therapeutic virus (right) and grown in a diabetic mouse. 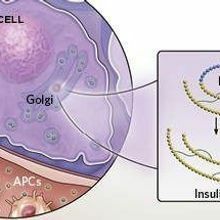 The green staining shows insulin-making cells.GEORGE GITTES AND XIANGWEI XIAOResearchers have successfully treated animals with a mouse version of type 1 diabetes by inducing pancreatic cells that don’t normally produce insulin to manufacture the protein, according to a study published today (January 4) in Cell Stem Cell. The research team, based at the University of Pittsburgh School of Medicine, didn’t expect the experiment to work—since type 1 diabetes arises when the immune system turns on cells that naturally produce insulin, they expected that inflammation would quickly wipe out the engineered cells as well. 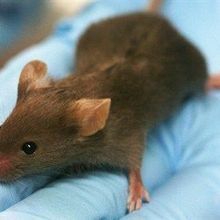 But instead, the mice thrived for four months before an immune reaction destroyed the cells. 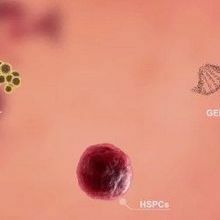 Gittes and his colleagues constructed an adeno-associated virus to carry genetic material that would direct so-called alpha cells in the pancreas to produce insulin—normally the job of beta cells. 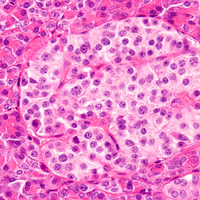 They then delivered the virus directly to the pancreas of mouse models of type 1 diabetes. The animals’ blood glucose levels stayed at normal levels until the engineered cells were killed off months later. The team is now trying out the strategy in non-human primates, according to a statement, in hopes of eventually bringing it to clinical trials. However, it’s unclear how long the treatment might work in humans, if at all.